I had a few concerns when I moved Harv. The new place has individual pastures -- something Harv had never liked, and at least once in his younger days, he'd injured himself running the fence on individual turnout. Partly because the pastures have an adjoining fenceline, Harv was calm from the get-go. The stalls are not too far from the property owners house, too. Do you all recall that Harv has a "moose call" whinny? I imagined him disrupting their household with his noisy neigh. Fortunately, that hasn't happened either. 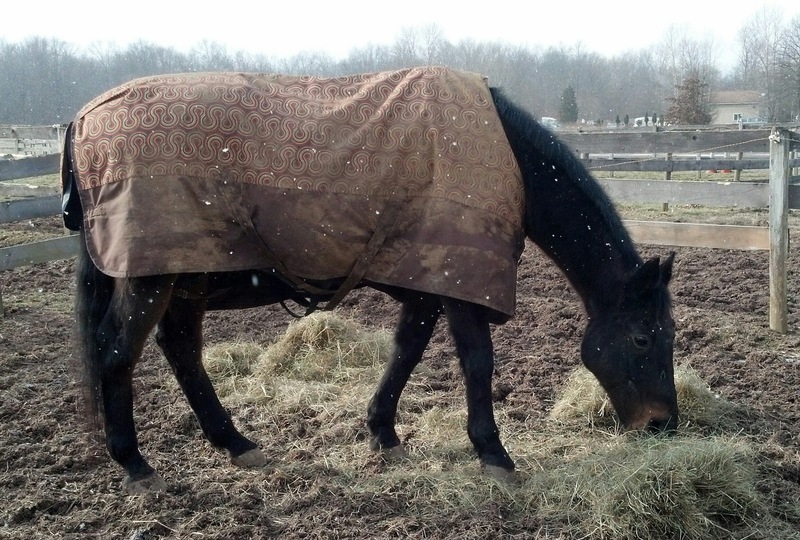 While the move was financially driven, there were also many positives about the new place, especially for an older horse. Turnout is 8-12 hours a day in reasonably good weather. Dutch doors! Harv has an outward facing dutch door and an open stall front with a "v" neck so he can hang his head out. Dutch doors are horse-friendly, and something I really love. So does Harv. Customized care. When there are only four horses, each horse gets his own program, and it is possible to switch things up a little -- like vary the turnout according to the weather -- which you can't do as easily with 15-20 horses. I'm so grateful to have found this place, right when I needed it. It's wonderful. It sounds lovely. I love a small situation for a retiree so they don't fall through the cracks in a bigger program. Sounds like the perfect place for sweet Harvey. Having met him, I suspect he will quickly become adored there. I am hoping he will be totally spoiled and as totally loved by everyone there as he already is by you. My retired mare lives at a two horse private home. She is so happy. I do fantasize about having them both together but she's so much happier. I wonder how other people handle their retired horses.